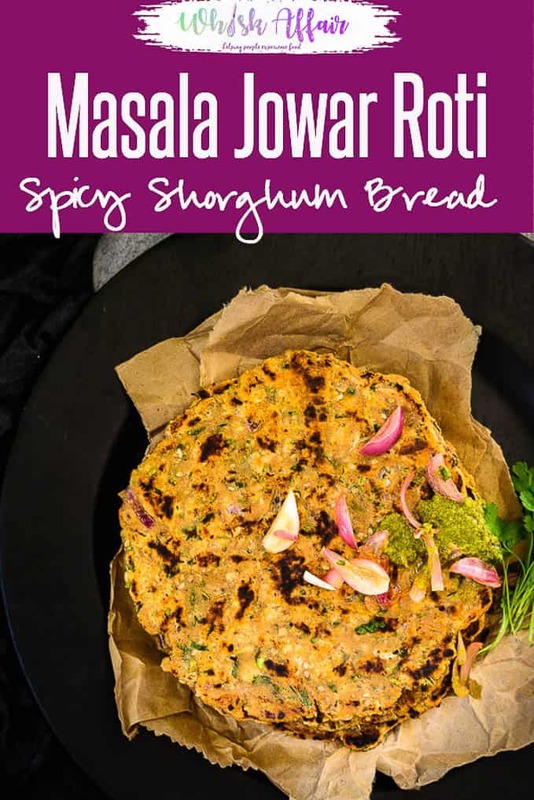 Masala Jowar Roti or Masala Jolada Roti is an Indian flatbread, made using sorghum or jowar flour and spices. It can be had as is or with a pickle. Here is how to make Masala Jowar Roti. Jowar Roti or Jolada Roti is an Indian flatbread, made using sorghum or jowar flour. Unlike wheat, Jowar is naturally gluten-free and is therefore considered very good for health and well-being. A uniqueness of this roti, is the traditional way of preparation, flattening it with the hands till it becomes big. This is very similar to the way elders prepared it in the villages before the advent of refined wheat flour and chapattis. 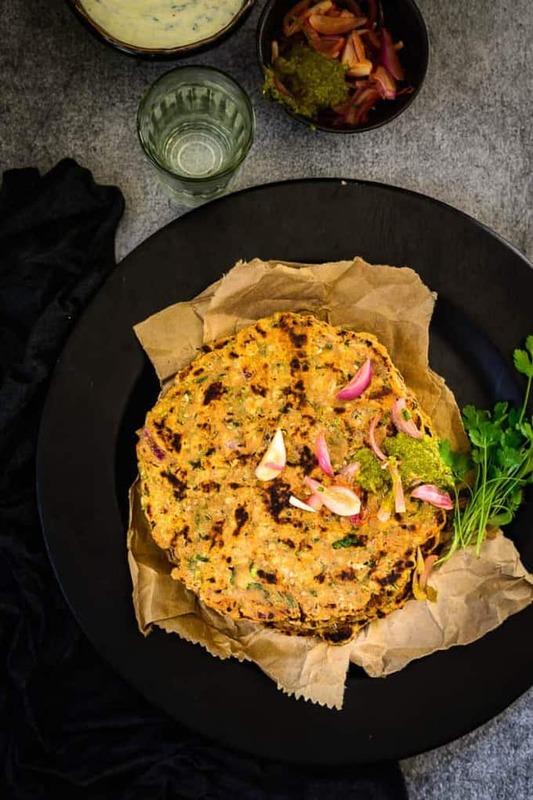 Masala Jowar Roti incorporates some vegetables into the roti, making it extra nutritious. The spices of cumin powder, sesame seeds and green chillies, add a special taste to it. 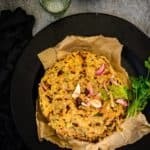 This masala Jowar roti can be enjoyed with some dry sabji like Veg Tikki Masala, with Mango Pickle and some raw onions on the side. Here is how to make Masala Jowar Roti. 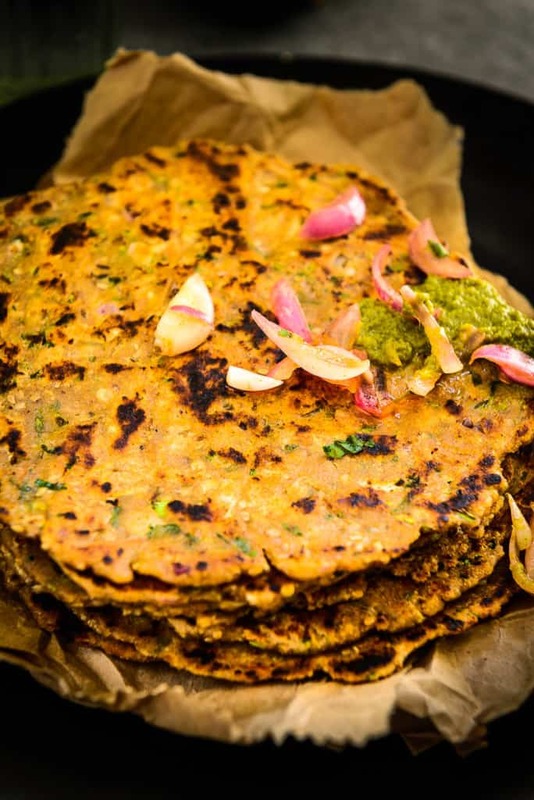 Masala Jowar Roti or Masala Jolada Roti is an Indian flatbread, made using sorghum or jowar flour and spices. It can be had as is or with a pickle. Add all the ingredients in a bowl and mix well using your fingertips. Slowly add warm water and make a soft dough. Make a big lemon size ball from the dough. Keep it on a aluminium foil and gently pat to make a 5-6 inch roti. Wet your hands in between patting the roti. Make a hole in the centre using a finger. Transfer the roti on the griddle along with the foil with the roti side down. Cover the roti and let the roti cook for 2-3 minutes. Remove the foil and gently flip the roti. Pour some oil in the hole and over the roti and cook until golden brown spots appear all over. Serve hot with chutney, raita or any curry. Is the whole wheat flour to bind the dough together? If so can it be substituted with potato? Thanks for sharing this wonderful recipe. Hi Ratna. Yes it helps to bind the dough. You can use potatoes instead. These look great. Maybe add a suggestion on how to make it gluten-free. Wheat isnt gluten-free.